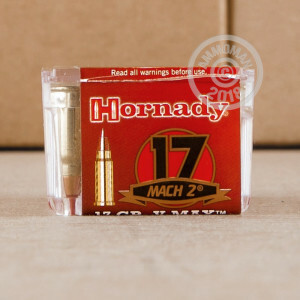 This 17 HM2 cartridge from Hornady’s Varmint Express line of ammunition features a 17 grain V-MAX projectile. This bullet’s pointed polymer tip does more than significantly hike up its ballistic coefficient -- because it is perched over a hollow cavity within the bullet’s precisely formed swaged lead core, it gets driven deep down in there upon impact to initiate rapid, violent fragmentation. The result is a bullet that you can count on to positively aerosolize varmints, whether they’re jeopardizing your golf course or otherwise. 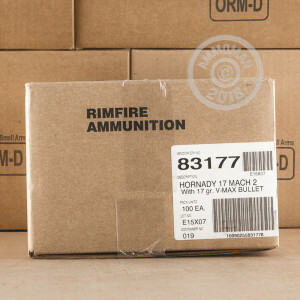 These cartridges additionally offer select brass casings, virtually perfectly consistent propellant loads, and rimfire primers that are matched to their caliber to provide fast and complete ignition. 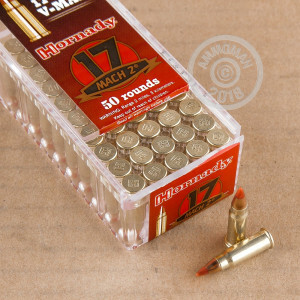 Hornady didn’t let these 500 rounds leave their doors without hand inspecting each one, so you can count on real Nebraskan quality in this order.